IRS Tax Attorney Downers Grove: When Does Tax Season End? When is the 2017 Tax Filing Deadline? The normal deadline for individual tax returns is extended to Tuesday, April 18, 2017. 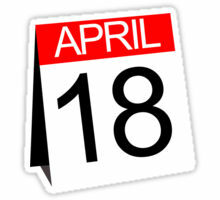 Individual tax returns are due this year on April 18. Because April 15 falls on a Saturday, the date would normally be extended until the next non-holiday business day. (This is the “Weekend Rule”.) But Monday, April 17, 2017, is Emancipation Day, a legal holiday recognized in the District of Columbia. Therefore, the deadline will fall on the next business day, Tuesday, April 18. 2017. This date will affect many important items to taxpayers. Because of the 3-year statute of assessment, but also because of the Weekend Rule, those filing amended returns will also have until Monday, April 20, 2020, to file Forms 1040X for year 2016 returns. As always, the deadline is June 15, 2017, for any nonresident alien that files Form 1040-NR. Still, those same people who have wages or other compensation paid in the United States need to file by April 18. It just happens that Easter also falls on that Sunday, April 16, 2017. However, whether for a children’s Easter egg hunt in Oakbrook, IL or the annual Easter Promenade in Charleston SC, the extra day affords taxpayers and practitioners an extra day to enjoy the special day as well. When you are in need of an IRS tax attorney, be sure to contact Tax Law Offices today!